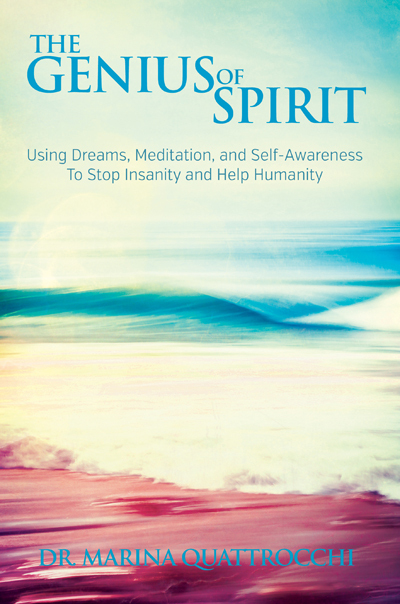 The Genius of Spirit: Using Dreams, Meditation, and Self-Awareness to Stop Insanity and Stop Humanity is my second book arriving spring 2014 after 13 years of research and reflection. In many ways it is a follow-up to Dreamwork Uncovered, focusing on the wisdom of dreams, but also examining meditation, and much of the current research that extols its many health benefits. The book’s premise is that we do not have to wait to visit heaven, since heaven is not a physical or geographical place–rather a state of mind, a heightened vibration we can reach when we are in peace with the world. We don’t have to die to reach heaven on earth, because it can be part of every day. We begin by infusing our lives with perhaps five minutes of meditation each day, allowing this time to grow and lengthen, until our vibration raises to a level where much of our day is one of peace and tranquility. Inversely, hell is also not a physical place with eternal flames and demons, but our life on earth can be a living hell, if we are disconnected from our spirits, or dominated chiefly by the left brain. A second key premise of the book is that we can reach heaven on earth if we understand the importance of achieving balance or harmony between the left and right brain. In the Western world we are completely left brain dominated, often the reason for depression, despair, suicide, and that all too common feeling that life is meaningless. Although there is great value and merit in the left brain–the realm of data, facts, and information–it will never bring us inspiration, peace or love. We can only access this essential part of our being if we learn to connect with our right brain through prayer, meditation, dreams, or acts of love, kindness, and service to others. This is the key to creating heaven on earth. This is the genius of spirit. The first half of The Genius of Spirit examines left brained merits and short comings. We look at our world’s obsession with greed, accumulating massive sums of money, and the rise of millionaires and billionaires at an ever accelerating pace, as the poor just get poorer. This division has never been so extreme or lopsided in history–all a product of our left brain dominance. To counter this we also look at many geniuses, men like Alfred Nobel and Albert Einstein, who used left brained wisdom balanced with right brained compassion to make the world a better place. Both men were huge humanitarians and this is the model for a wise and sustainable future. We move into the 21st century with humanitarian role-models like Craig and Marc Kielburger, Roxanne Joyal, and Ricky Martin. The second half of the book examines strategies for connecting and strengthening your right brain. Only with the right brain informing the left brain, can we make decisions which will help us evolve towards self-realization or enlightenment. A central thesis of the book is that we are all meant to achieve the genius of the enlightened state–just as we are all meant to experience heaven on earth. Enlightenment was never meant to be the realm of just a few chosen gurus, holy men, or saints–it is a state of harmony or peace that is the intended destiny of everyone. When we reach this place, every day of our lives is a heaven on earth! Incorporating a daily meditation practise into our lives and listening to the guidance and wisdom of dreams, are two of the best ways to connect to our hearts, spirits or the genius of the right brain. Proposes a New Understanding of Genius Based on IQ tests, we’ve had a limited view of what constitutes true genius, and we’ve realized these tests can be inaccurate and misleading. Marilyn von Savant who currently holds the world’s highest IQ, was listed in the Guinness Book of World Records as the world’s smartest person with an IQ of 228. But, her score changed every time she took another test, so, after five years, this category was omitted. We’ve equated success with high IQ’s, but even Mensa, an elite group of geniuses, the top 2 per cent of the population explains its members are high school drop outs, and on welfare. I’m proposing a new understanding of intelligence, based on my experience administering IQ tests, the latest research, and much reflection. True intelligence combines both head and heart, or right brain and left brain functions, and it has the potential to heal our troubled planet. Hitler was an intelligent man, but did nothing to assist humanity. I’m advocating a theory of true genius using Einstein as a model that involves humanitarianism–operating with our hearts and souls to make the world a better place–allowing spirit to infuse our minds with heart felt wisdom. We can all be geniuses; in fact, it’s our destiny. Only when we begin operating with the wisdom of spirit, will we eliminate poverty, wars, and insanity. We Have the Ability to Cross Dimensions Each night while dreaming we cross into other dimensions, but perhaps in the near future we won’t need to be asleep to do this! In the physical world, this can also happen through meditation, by walking in nature, or visiting places of great beauty where we feel transported. Through dreams and meditation we can learn to hold onto these mystical moments, and begin to experience them more while awake. Crossing dimensions has been documented historically with civilizations that simply vanished: Atlantis, the Aztecs, Incas, Avalon, and Shangri-La. We’ll discover dimensional travel is no longer mere speculation. Imminent scientists believe we’ll have the ability to teleport to other dimensions in the foreseeable future. One hundred years ago people believed flying airplanes was a physical impossibility. Perhaps in a hundred years dimensional travel will also become a way of life, even replacing airplanes! Chaos of Soul and Spiritual Contracts Our soul is essentially in chaos, always trying to wake us up and help us become more aware, while our ego or mind is running the show. This is critical, since the mind has no true wisdom or empathy–only logic or facts, and it may repeat the same faulty patterns for eternity. We live in a left brain world, at odds with our real purpose for being here–to work through our karma, connect with our spirit, and carry out our destiny or dharma. We get so caught up in the physical world, we don’t allow time for journaling dreams, reflection, and meditation. The mind keeps running on the same grooves, repeating karmic patterns lifetime after lifetime. We’re always getting hints in dreams, through hunches, gut feelings, and often through the media-songs, movies, books, but are often unaware of this constant guidance. An essential feature is the explanation of our spiritual or soul contract. This helps us understand that life is not unfair and we’re not victims–nothing is by chance. Before we incarnate we choose where we will be born, who our parents will be, our schools, workplaces, careers, friends, all the places we will live, whether we will marry and have children, where we will travel, and how and when we will die. This spiritual blueprint is uniquely designed by spirit to help us evolve and work though our karma or issues, until we reach the spiritual genius of dharma or full enlightenment. Limitations of the Ego or Mind The ego or mind is largely responsible for all the chaos, wars, hatred, and destruction on earth, because our minds are disconnected from our spirits. Ego and mind are actually the enemies of humanity, and we are trying to use this faulty tool to navigate through life. Learning to balance our minds with spirit is critical. We may begin developing out of control egos when we are put down, abused, humiliated, or disrespected. The ego compensates by pumping itself up, and we go through life with a lopsided ego, never feeling secure and never understanding why. The ego is never satisfied and is not capable of feeling love, peace or contentment, only spirit can lead us there. This is why we have millionaires buying car after car, estate after estate, never feeling it’s enough, never finding true happiness despite their wealth. Karmic Loops and How to End the Pain and Insanity With our left brain running the show, it’s extremely difficult to be aware of karmic loops, or how we get stuck in the same wheel of karma lifetime after lifetime. For example if someone is an alcoholic in this life, chances are they had this problem in many previous lifetimes. If someone is an incessant worrier, judgmental, or prone to malicious gossip, these can also be traits carried over from the past. We are victims of our own undoing, until we step back, and see how these loops effect us. Readers will begin to understand and identify their own karmic patterns, so they can begin working through the loops, then literally stop their physical and emotional pain.Humorous examples in fairy tales and movies such as Groundhog Day are used to illustrate these patterns. We are Energy or Spirit from Other Dimensions Each of us is here to evolve spiritually–we are evolving, but believing that we evolved from apes, diminishes our dignity, and excuses us from taking responsibility to clean up karma from previous lives. Until we do, we will live in a personal hell of pain and chaos. We become so immersed in karmic loops and the dramas of life we start believing we’re just a physical body. There was a great fall, from which we are still recovering, but we did not all come from primitive civilizations or live in caves. We’re much like royalty waiting to regain our crowns. Most people living on earth originally came from evolved planets and dimensions, and we’re doing time on earth until we clean up our karma. When this is accomplished we can return to our true homes. We’ve never figured out how the ancients built the pyramids, or developed their heightened understanding of planets and astrology. All of these technologies were brought to earth by our ancestors, evolved spiritual beings from other dimensions or planets. We Are All Natural Meditators. Meditation is not something mystical or mysterious– like dreams it’s part of life. Everyone has meditated in some fashion, we need only to determine which meditative activity we enjoy most that fits our lifestyle, whether it be walking our dog, watching sunsets, fishing, mowing the lawn, sailing, dancing, painting, cooking, or yoga. We don’t have to use our life savings, and travel to an ashran in India, to meditate. We don’t have to spend hours each day involved in formal mediation because this may take us away from important responsibilities. If we learn single pointed focus, rather than being tossed around by the whims of our left brain, then our entire day or life can become focused–that’s really the goal. Hugging someone slowly, mindfully sipping a glass of wine, or slowly eating dinner can all be meditative activities. How many of us chase after elusive dreams, only to be disappointed? For over forty years I believed the key to happiness and success lay in academics. I assumed with a university education, the natural outcome would be more money, hence, happiness. In this quest I pursued degree after degree, finally achieving a doctorate in psychology, but this certainly didn’t make me happy, healthy, content, or wealthy. By my early forties, after experiencing daily migraines for over twenty years, I was completely burned out, and only when I stopped working, and left the insanity behind, did I finally reach moments of that magic elixir I had always been searching for–peace and contentment. These emotions didn’t come from books, but through dreams, meditation, and many long walks and bike rides. Since then, I often experience what I refer to as “heaven on earth,” living in this world but momentarily being transported to a dimension that is definitely better than the best drug or alcohol money could buy–except this state is absolutely free and available to everyone. These moments of nirvana or bliss can be reached if we make the efforts to journal dreams, meditate, and strive for greater awareness. Instead, we go in the opposite direction, chasing power, working longer hours to make more money, all trying to achieve that elusive success. But, success in its truest form is free-it’s internal, it’s that blissful feeling of heaven on earth, or connection to spirit. It’s transcending thoughts that our entire life must lead only to a comfortable retirement. We have the potential for so much more–a stop to endless cycles of insanity on earth! Currently, the world’s super powers are spending more money on war and nuclear weapons, while the rest of the world is starving, doesn’t have clean drinking water, is illiterate, and dies daily of infectious diseases. This could all be eradicated it the world’s G7 nations spent only 0.7 of their gross national product on humanitarian efforts. It is a world of insanity–the United Nations has estimated if we spent $13 billion a year, we could eradicate poverty worldwide. It is achievable, only our values and choices are skewed. Instead, we spend $18 billion a year on makeup! In Canada alone, we spend 1.9 billion dollars, or an average of $414 per person, on Boxing Day, after we’ve already been indulged with presents the day before, and, this number climbs steadily each year. This insanity begins with our power training as children, and ends with a world out of balance. It is largely left-brained, ego based thinking. The left brain is the domain of logic, language, linear thinking, while the right brain is the area of heart, compassion, creativity and caring. We will only create further insanity, unless we shift to a balance of head and heart, or right and left brain thinking. The entire book is a manual for achieving this, showing how dreams are always attempting to move us in this direction. It’s about living wisely and well, in a way where we achieve heaven on earth and help humanity as we’re stopping personal insanity. We have never understood what constitutes true genius, since a genius can be either an unemployed starving artist or a billionaire entrepreneur. We examine how intelligence is currently defined, and many of the problems with traditional IQ tests. In the past experts believed intelligence was fixed and that IQ would determine success in life; now we know this isn’t true. Intelligence is like a muscle–we use it or lose it. We’ve also made great strides in understanding the right and left brain functions and how they can work together as one harmonious unit to create genius–this involves using both head/logic and heart/intuition. Until we understand and work toward this synergistic harmony or blend, we’ll keep on doing unethical and inhumane acts, or failing to take action when needed. We look at several ground-breaking studies of the last decade proving that meditation does increase gamma brain waves, intelligence, and compassion. Many of the characteristics that defined our greatest minds are explained; hard work, going against the grain of society, not worrying what other people think, being able to think outside the box, and spending much time in creative and solitary meditative activities. To illustrate this, we examine the lives of Alfred Nobel, who developed the Nobel Prizes, and Albert Einstein, considered the greatest genius who ever lived. Few people are aware that the second half of Einstein’s career-roughly thirty years was chiefly humanitarian pursuits. Although we can learn much for examining geniuses in the last century, we are entering an more awakened time. Geniuses will not live in isolation as Nobel did and other great thinkers like Tesla, Cavendish and Heaviside, who were brilliant but socially inept and incapable of loving anything besides their work. A 2010 study of elite students who scored 100% in secondary school found they were focused on school work, but poised and popular. Their volunteer hours were spectacular; often they clocked 600 hours, a testament to their balance of head and heart. This trend is examined through Craig and Marc Kielburger, Roxanne Joyal, and Ricky Martin, all great humanitarians combining head and heart. They’re brilliant, but work tirelessly to make the world a better place, and this is what sets them apart. Our soul is in chaos, always trying to guide and inform us, while our less developed and unaware mind runs the show. When we wake up spiritually, our soul will not have to come back again and again. Soul knows it could be in elevated dimensions, places of great beauty and purpose, if we cleaned up our karma while on earth, and completed our spiritual blueprints. For the soul these endless incarnations are like never graduating from high school-a virtual prison. Karma and dharma are examined in detail, particularly the ripple effects that karma creates. A soul’s contract is explained, along with all the karmic and dharmic insights one person may need to achieve in a lifetime of 90 years. Enlightenment is discussed, not as a final goal, rather little ways we can begin achieving this state of heaven on earth right now. For many the concept of enlightenment is simply too mind boggling; being able to cross dimensions, bilocate, or dematerialize–except we do this every night while we sleep and dream! We can take small steps; no longer getting in arguments at home, losing fears of failure, not getting colds every winter, or feeling greater peace each day through meditation. Small steps, over time, became the transition into heightened awareness or heaven on earth. The brain is like a sophisticated computer that can run faulty programs, develop a virus, or completely break down if one develops a serious condition like Alzheimer’s. The mind may take years gathering data to make a decision, while spirit or intuition can arrive at truth in a heartbeat. Negative thoughts, and faulty mind programs such as “I’m not good enough,” or “I can never do this,” stem from the mind, while wisdom, truth, and hope, spring from spirit. The mind will constantly delude us, but, dreams and meditative experiences, products of spirit, never fail to give us insightful truth. This chapter explains how the only three functions of the mind are; 1. To protect our body 2. To help us carry out day to day tasks 3. To make decisions. Since the mind is our decision maker, it’s imperative these decisions are fueled by the wisdom of spirit. If not, we keep incarnating and running the same faulty programs. The mind is like an impetuous two-year-old wanting all the control, despite having no knowledge of our previous lives or spiritual contract. All that information is known only to our soul or spirit which can inform the mind if we allow it, through dreams and meditative experiences. Fear is absolutely crippling and disempowering and it requires enormous energy to maintain our fears. Every time we’re afraid a burglar may break into our house, we lose a bit of our power to an unknown entity. Since most fears are completely unfounded, a popular acronym is False Evidence Appearing Real. We become aware of how pervasive unfounded fears are; many of us are afraid of hundreds of things. Because of this, a key function of dreams and meditation is to help us release these fears and reach a place of fearless bliss or faith. Dreams help us face and overcome our worst fears, often using humour to achieve this. For example, if we’re afraid of our boss, we may rehearse situations in dreams where we stand up to them or forcefully give needed advice. We may vent explosive anger in dreams that wouldn’t be possible in real life without losing our jobs! Or we may dream of them as a Shrek-like character, watching as friends push them around, until we realize they are harmless. The shadow is one of the most fascinating aspects of our personality, but since it is our dark side, or karma, it’s also the part of us that is least understood and hardest to recognize. The shadow is also our unlived life, those aspects of our personality we’re afraid to explore. (like the teetotaler afraid to take a drink) We examine what the shadow is, and how to recognize it. If we’re unaware of our shadow, we will project it onto others, and so we belittle, criticize, judge, put down, and disrespect anyone who mirrors our shadow qualities. This keeps us trapped in endless cycles of karma–essentially victims caught in our karmic web without the awareness we’re even in it. Several humourous examples are given of characters who were caught in karmic loops, unable to free themselves; the story of Pinocchio, the movie Groundhog Day, and the story of Dr. Thomas Harvey, the man whose life fell apart after performing an autopsy and stealing Einstein’s brain. We’re all in karmic loops, and our challenge is to recognize them. Through the story of a monk in the movie Samsara (Sanskrit for wheel of life) we see that living as a monk or hermit may be easier, since everything is decided for you, while secular living with all it’s pain and challenges can be brutally difficult. We need to give ourselves credit for this courageous task we’ve chosen, and realize it’s not impossible to break through these karmic loops that bind us. Through several dreams we see how dreamers have achieved this awareness and broken free. Miracles and visions are part of life, and portals between heaven and earth have been opening in the last century ushering in a time where greater numbers of people will believe in and experience the miraculous. This takes us back to the book’s beginning, where we discussed the possibility of crossing dimensions and experiencing moments of heaven on earth. A miracle is simply the spirit world opening up and making itself visible. Angels, guides, and enlightened beings are here all the time, but they vibrate at such a high frequency we can’t see them. When a vision or miracle occurs, a portal or door is opened, allowing us to see into these other dimensions. With an authentic spiritual experience, there is never any fear or trepidation–this is how we can be assured the experience is truth. A vision or miracle will leave us with a sense of awe, comfort, peace, or reassurance. Often people having these experiences intuitively know it’s something they don’t need to talk about, because others would demean its sacredness. I discuss many present-day miracles, and a powerful vision I had in 1985, after being burned in a fire, while I was hovering between life and death. This vision was incredibly healing, giving me the momentum needed to get through the next five painful years. The intent is to take the mystique out of these experiences, because like dreams, they have the potential to heal, and provide tremendous faith and hope. Just as we couldn’t survive without dreaming, it’s virtually impossible to navigate through life without ever having any form of mediation. Our left brain, like a highly sophisticated machine, can’t run constantly; it needs down time. Most of us have been natural meditators since childhood, but we’re unaware that many of our favourite activities are meditative. Walking, watching a sunset, sitting by water, watching a fireplace or aquarium, nature photography, gardening, cycling, swimming, canoeing, and yoga are all forms of meditation. Anything we do that is quiet, solitary, with a single pointed focus, is meditative, and a few minutes a day is sufficient to start. We’ve been socialized to think that we must sit cross legged, burning incense and chanting “Om” for hours to meditate properly. Practical suggestions are given for both beginning and seasoned meditators. This chapter also addresses the phenomena of technology dumbing us down, and the trend to multitask, which weakens our brain’s ability to focus for any period of time. Since our brains can only focus on one thing at a time, learning to meditate even for short periods of time, is the most effective way to restore the brain’s balance and efficiency. Meditating on dreams will help us discover deeper insights, since dream work and meditation were always meant to go hand in hand. We end with enjoyable meditations with food, sipping wine, eating chocolate, and savoring cheesecake for the novice meditator. Hopefully by the end of this chapter, the reader will discover that meditation is something we can all enjoy.